Madoka, Sayaka and Hitomi are close friends. One day a magical cute-looking creature named Kyubey appear in front of Madoka and Sayaka and offer to grant them any wish in return of they become Magical Girl (Mahou Shoujo). Homura, a new transfer student in their class, is also a Magical Girl, but she tries her best to prevent Madoka from being one. Homura is trying to kill Kyubey when Madoka and Sayaka see it for the first time. 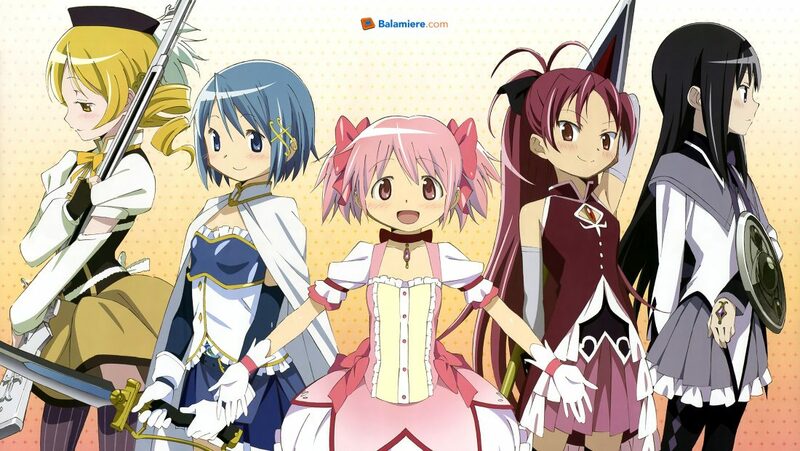 Another Magical Girl named Mami appears and helps Kyubey, Madoka and Sayaka. Then Mami explains a little bit about being Magical Girl to Madoka and Sayaka, including giving them some “tour” to see first-hand about Magical Girl’s battles against evil Witches. Witches curses people and Magical Girls are there to protect people. That’s how it started. The first two episodes of this anime are very typical mahou-shoujo story-type. Very typical to the point of boring. Plus the drawing of this anime is… (frankly) crap. However, I assure you that this anime is nothing like the usual mahou-shoujo anime. Continue watching and you will find out why. To avoid spoiler, I will not write further about the detail, but I can tell you they have a very interesting concept of “mahou-shoujo”. A dark and ugly one. I especially like the music. Naturally, since I always love Kajiura Yuki’s works. Recommended for age 15+ (death scenes).